We’ve created a line of Industrial Digital Media Players optimized for a range of digital out-of-home (DOOH) advertising installations. Our digital signage solutions include multi-screen and CEC capabilities, small form factor enclosures and powerful processing for media-intensive applications. From retail applications and manufacturing job instructions to in-vehicle and transportation terminal displays, Logic Supply digital signage computers help you effectively, and reliably deliver your message. I would never use a consumer grade product in a commercial digital signage installation. 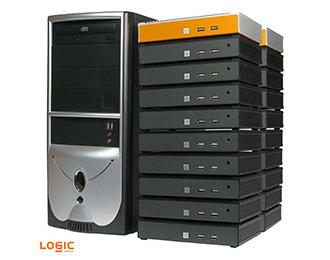 Logic Supply builds the industrial hardware that SmarterSign clients depend on to operate effectively 24/7. —Gregg Zinn, Founder and CEO of SmarterSign, Inc.
Our small form factor, fanless and ventless hardware lets you install a highly capable digital signage player wherever you need it. With the latest generation of powerful processors, our media players put you in complete control of your displays. With a range of video outputs, Logic Supply hardware lets you deploy a single screen or easily build a multi-display installation. 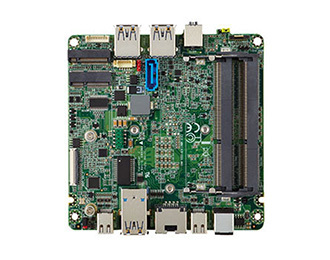 Intel’s Next Unit of Computing (NUC) is an ultra-compact motherboard form factor measuring a mere 4 x 4 inches, without sacrificing power and performance. While there’s no universally accepted definition, the industrial PC industry defines small form factor as anything smaller than your standard desktop. 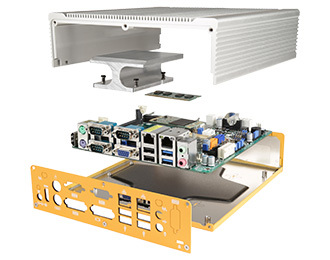 Fans are one of the most common failure points for industrial PCs, making fanless computers appealing to customers looking to ensure optimal reliability.